When designing your home, it’s important to remember that not all artwork hangs on your walls. Beautifully crafted modern ceramics are truly works of art in and of themselves, and adding those one-of-a-kind items (you know, the ones that you can’t seem to get out of your head even after you’ve left the shop/fair/website) is an easy way to infuse your personality into a space. Of course, one-off pieces can get expensive since you’re paying for the artist’s time, skill, eye, and materials, and then usually a markup at the retail level. That’s why I love finding ceramics on Etsy, where you can purchase direct from the makers themselves! This New Mexico-based collective of creatives makes my favorite mug of all time. 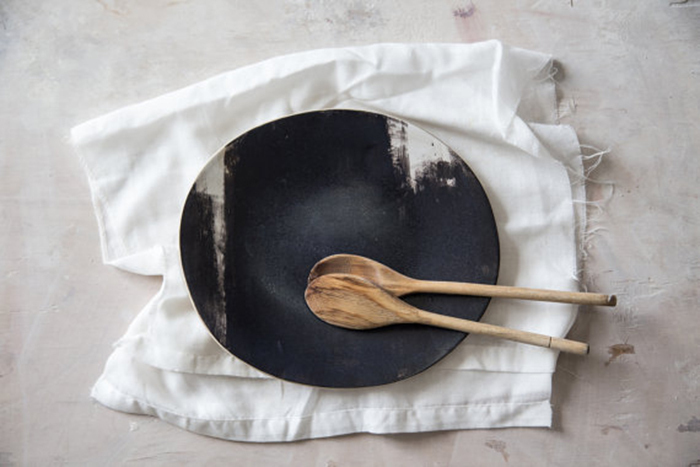 Besides being genuinely awesome people, their stuff is minimal, rustic pottery at its best. Based in Israel, industrial designer Yaara creates the most interesting surfaces in her ceramics—from marbling and speckled paint to dipped and fully glazed. I love, love, love Convivial Production’s unique geometric take on ceramics—their cut-out trivets and bowls seem to defy gravity, while their hexagonal dishes (above) are beautiful in their simplicity. Meg Bundy’s Michigan shop is a great source for interesting planters, both hanging and table top. Inspired by Native American pottery, her bold, graphic designs are the perfect blend of old and new. This Israel-based shop has been a long-time favorite of mine! I love the humor and irreverence behind Dima and Nadya Gurevich’s work, like the adorable little face planters above. Don’t miss their rain boot vase! Lisa Patsy’s small Pennsylvania-based shop is so much fun to browse; I love the textures and patterns created by her carvings. Orit Ben Arie’s background as a graphic designer shows through her work, which often includes beautifully painted imagery such as on the bowl above. Her stoneware studio is based in Israel and produces small series of 2-10 pieces per design. Michael Keren Gelman’s shop (again, in Israel) is a breath of fresh air; full of unique pieces she creates using techniques like clay folding, engraving, and silk printing. Bay-area ceramicist Sarah Paloma crafts pieces that are a study in minimalism, with gorgeous silhouettes and incredible glazes that echo her inspiration influences (geology and ancient history). Lior Shacar creates truly organic and beautifully glazed pieces out of her Israel-based studio, with simple color washes and bold brush strokes that lend them an understated modern elegance. P.S. More Etsy sources, including some of the best for rugs, lighting, and pillows.